Crisafulli pumps. With the exception of the Rotomite-6000 CD and Rotomite-6000 CE, which use the GIW cast alloy pump, designed specifically to handle highly abrasive materials and slurries, Crisafulli Rotomite and FLUMP dredges use fabricated pumps made by SRS Crisafulli, which has engineered and built pumps for some 46 years. Lower cost and lighter in weight than cast pumps, Crisafulli pumps process soft and moderately abrasive materials more cost efficiently than cast pumps. See Crisafulli Pumps. Articulation of Rotomite's Cutterhead maintains a 80° cutterhead angle to the Material. An operator of the Rotomite-6000, Rotomite-6000 CD, Rotomite-6000 CE, or Rotomite-SD110, sitting in the cab, can control the attitude of the cutterhead towards the Material to be dredged for maximum performance. As the ladder, pump, and cutterhead are lowered, the angle (attitude) of a fixed (non articulating) cutterhead in relation to the vertical face of the Material changes - i. e., if the lowered cutterhead rises at a 30° angle from the lagoon bottom, without articulation the cutterhead will face the Material at a 60° angle causing a reduction in sludge production. With the Rotomite’s articulating cutterheads, operators can rotate the cutterhead up to 84 degrees to maintain a 90° angle to the vertical face of the Material to assure maximum productivity and minimum turbidity. Further, if they so desire, operators can articulate the cutterhead to carve difficult Material. Control Systems (Panels) for FLUMP™ Sludge Removal Systems. Crisafulli’s FLUMP is an unmanned dredge connected by cable to an electrical power source. See Cabled Traverse System. The FLUMP can be controlled manually by a full-time operator, or, alternatively, remotely and automatically by a part-time operator for lower labor costs and maximum solids production. See Radio Remote Controlled FLUMPs. 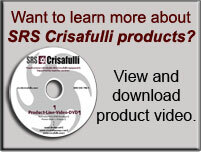 In addition, Crisafulli offers custom configurations of the control system. See Automation of FLUMP. Automating the FLUMP in a high utilization application - i. e., running almost continuously - is a smart business decision. Automation provides owners with excellent returns-on-investment "ROI" through reduced operating costs. Crisafulli staff will work with you to run the numbers based on analysis of your particular application to determine the most cost effective dredging solution for you. Hydraulically Powered Ladder. Each Rotomite model has two bi-directional hydraulically powered cylinders between the ladder and the Rotomite platform to lower and raise the rigid, steel ladder, cutterhead, and pump. Hydraulically powered cylinders enable the operator to exert the dredge's weight on the Material being dredged. In combination with cutterhead articulation, the hydraulic powered ladder increases the capacity of the Rotomite’s cutterhead to cut and process sludge. Only Rotomites offer a standard hydraulically powered ladder lowering and lifting mechanism. Crisafulli Integral Floating Discharge Line. To carry dredged sludge from FLUMPs or Rotomites to designated disposal sites, typically on land, FLUMPs and Rotomites use Crisafulli’s Integral Floating Discharge Line. Discharge Lines are modular, offered in either 15 foot or 20 foot rigid lengths, and 5 foot flexible lengths, in one of three styles – i.e., (1) aluminum pipe with aluminum floats; (2) aluminum pipe with foam floats; and (3) polyethylene pipe with foam floats. Crisafulli recommends starting at the FLUMP or Rotomite with a flexible section, then alternating rigid and flexible sections, and ending in a flexible section. Each section, either rigid or flexible, includes a female quick coupler, a ring clamp and rubber gasket. A #150 flange is available to adapt to a customer’s pipeline. The Discharge Line is offered in 4-inch, 6-inch, 8-inch, and 10- inch diameters. Crisafulli’s Floating Discharge Line systems are highly versatile, easy to set up and use, and can carry heavy, concentrated sludge across a pond to the discharge site, distances often over 1,000 feet. See Integral Floating Discharge Line. Pond Liner Protection System. Since many municipal and industrial settling ponds are lined with an impermeable membrane rather than concrete, Crisafulli engineered a pond liner protection system that prevents the cutterhead from cutting or damaging the pond liner. The Crisafulli Pond Liner Protection System “PLPS” can be attached to any Crisafulli cutterhead. Comprised of two small wheels mounted on an axle, the PLPS raises the cutterhead a few inches above the pond liner and enables the cutterhead to roll along the pond bottom. Propulsion and Steering System on Rotomites. Crisafulli's hydraulically powered propulsion and steering system for the Rotomites is unique in the dredge world. See Propulsion and Steering System. Providing both thrust and steering, the System provides adequate force to enable the horizontal auger on the cutterhead to engage, cut, and dislodge compacted solids. Unlike propulsion systems on many competitors' dredges, that either crawl along the lagoon bottom thereby generating substantial turbidity, or drive one or more "spuds" (or spikes) into the lagoon bottom and must be removed and the dredge relocated repeatedly by a support vessel during the dredging process, the Crisafulli propulsion system generates little or no turbidity and enables the Rotomite to be self-sufficient and move easily around the lagoon, canal, or river without external support. The System provides both forward and reverse thrust. The Rotomite propulsion system is more flexible and versitile enabling the Rotomite to be more productive and less costly to operate. The dredge operator on the Rotomite controls the propulsion and steering system from the comfort of the Rotomite's air conditioned/heated Cab.